The clouds would burst into color at sunset. 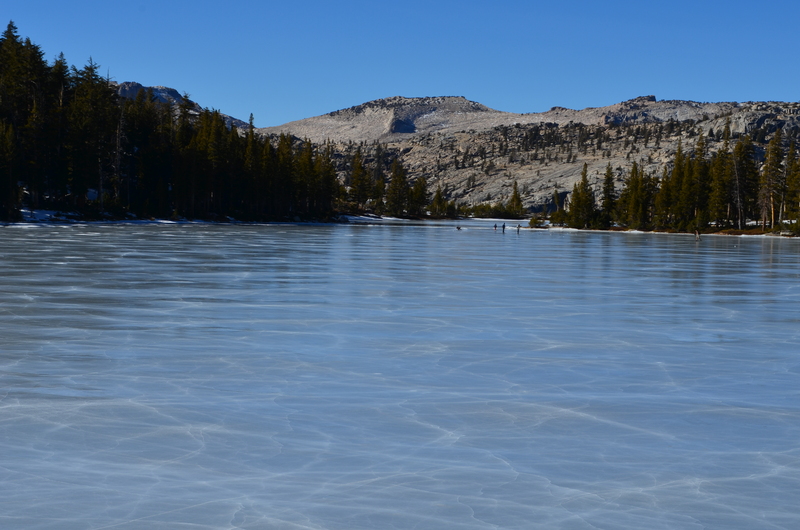 Looking north from Lower Cathedral Lake. The day at Lower Cathedral was most enjoyable. 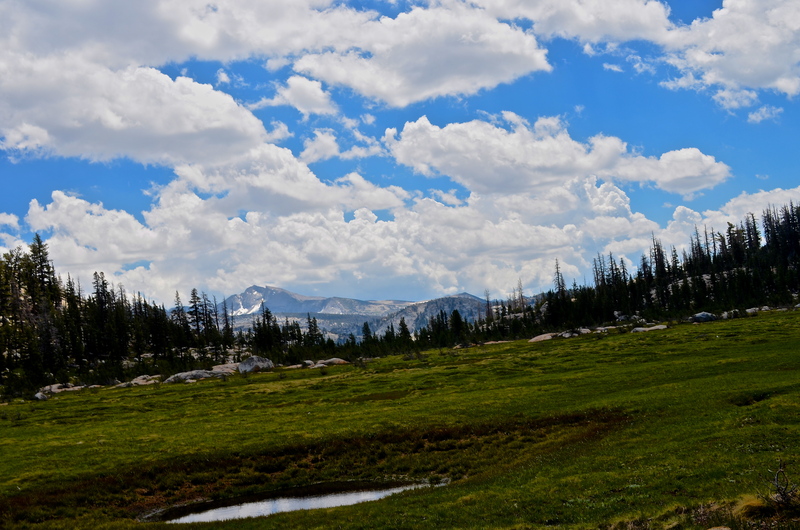 While my brother determined that there were no brook or rainbow trout in this part of the lake, we enjoyed watching the sky as clouds would form and morph into a variety of shapes. One could spend hours lying on their back watching the afternoon cumulus formations come and go. Alas, we had a goal in mind. Another 20 or so miles to go between today and tomorrow. At 9,400 feet and heading into Yosemite Valley it is mostly downhill for us. A climb out of Cathedral and up to Long Meadow and then our toes would be in for a beating. As we neared Upper Cathedral, a sign detoured us away from the meadow near the lake. Years of overuse and erosion had taken its’ toll on this area. 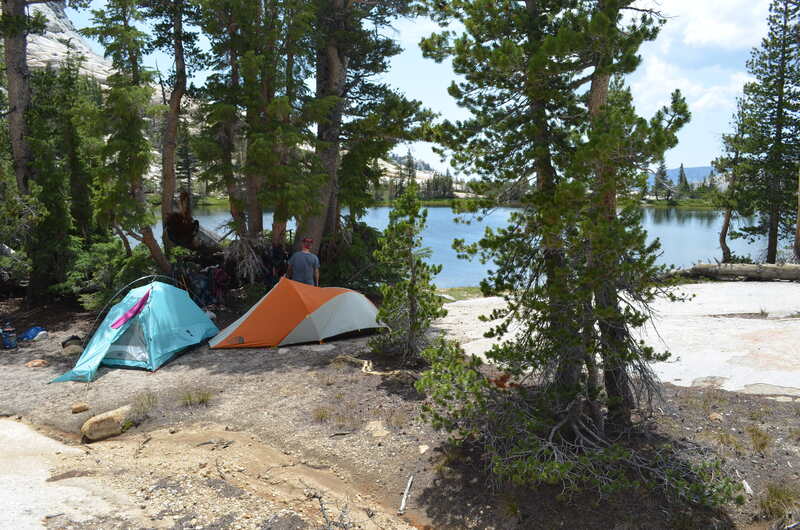 Am pretty sure you can camp here, but the JMT was rerouted a quarter-half mile to the east. 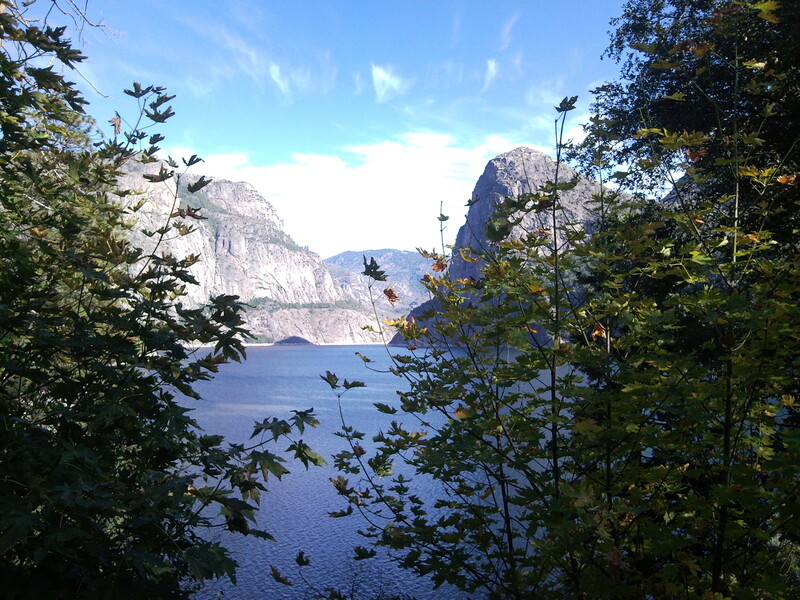 A neat thing about hiking is that depending on the direction you are going, the views can be drastically different. Occasionally, we would look over our shoulders to catch a glimpse of where we have been. 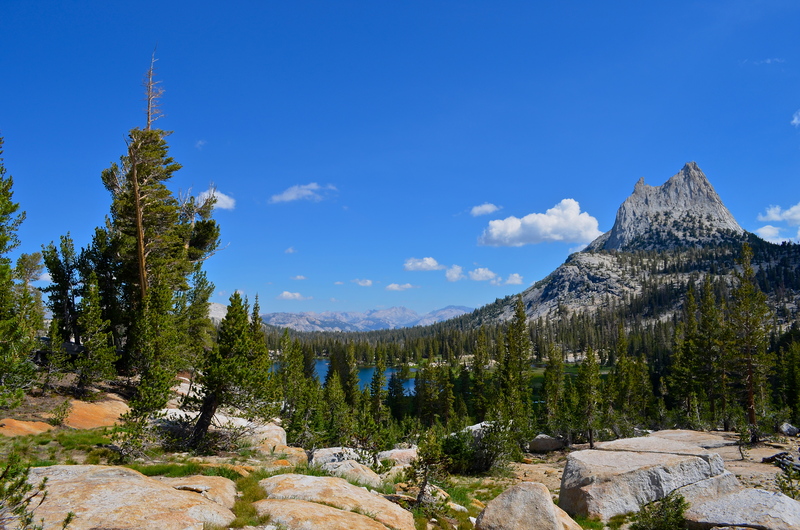 Cathedral Peak and the upper lake were prominent as we climbed Cathedral Pass. 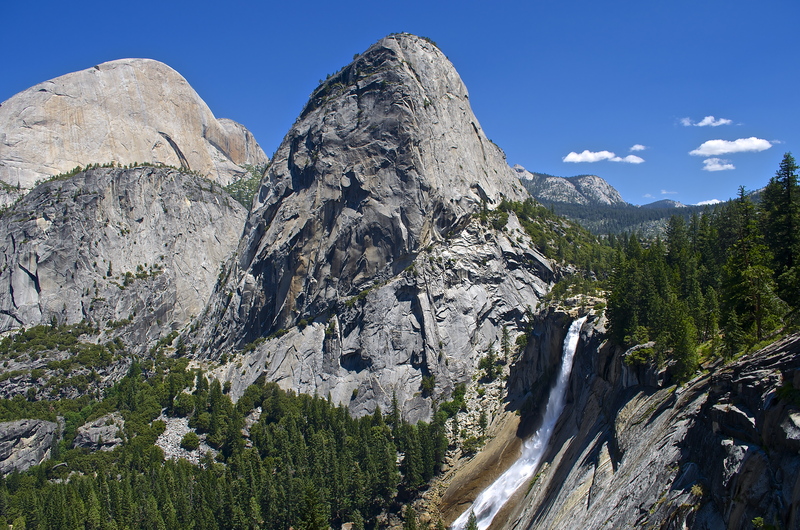 Farther to the north, we caught glimpses of Pettit Peak and the Grand Canyon of the Tuolumne River. 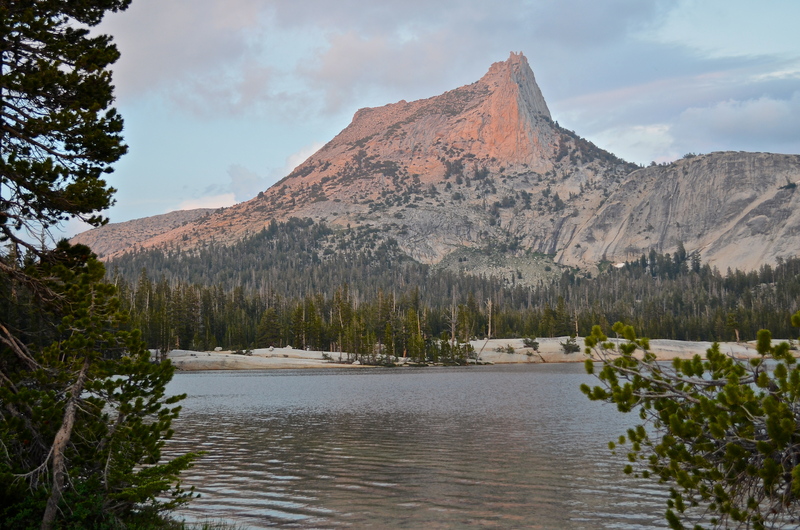 Upper Cathedral Lake, Cathedral Peak. We entered Long Meadow and were rewarded with a nice respite of flatness and views of the surrounding peaks. Man, the vistas just never stop here. If you only have 2-3 days, I would recommend the area between Cathedral and Sunrise Camp. 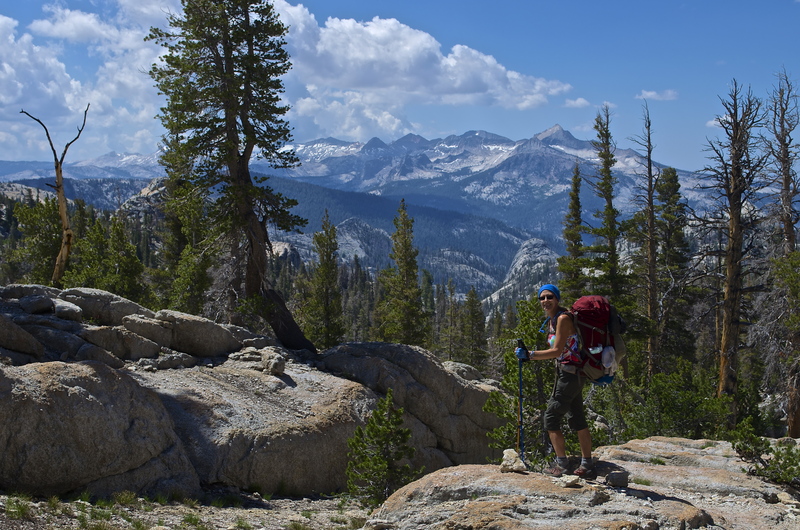 If you have 4-5 days, a loop including Merced and Vogelsang High Sierra Camp looks awesome. A last climb and we would see the rest of the Cathedral Range including Vogelsang and Amelia Earhart Peaks. We saw our first of what would be many mule trains around the Columbia Finger. As they passed, we quietly watched and snapped some pics. 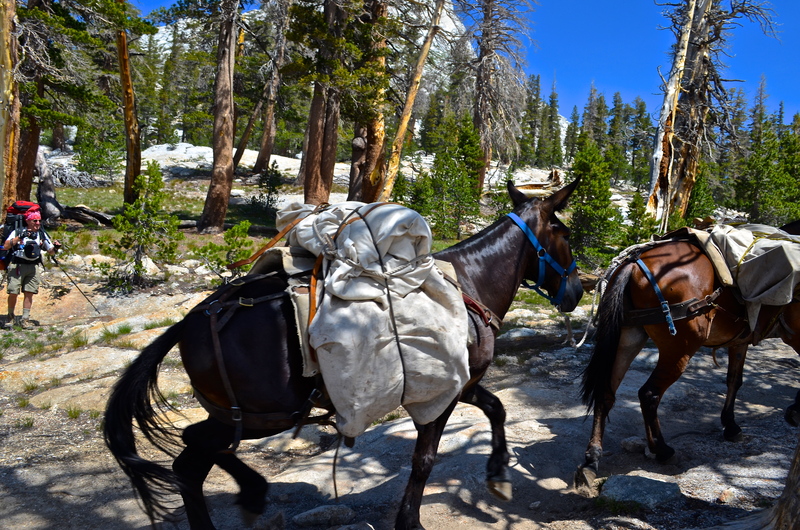 Most of the mules today were en route to one of the three local High Sierra camps including Sunrise, Merced and Vogelsang. These beasts of burden carried between 150-200 lbs of cargo. Sure footed, they followed their leader at a steady pace. It’s cool that this is still the primary means of resupply for the remote camps. 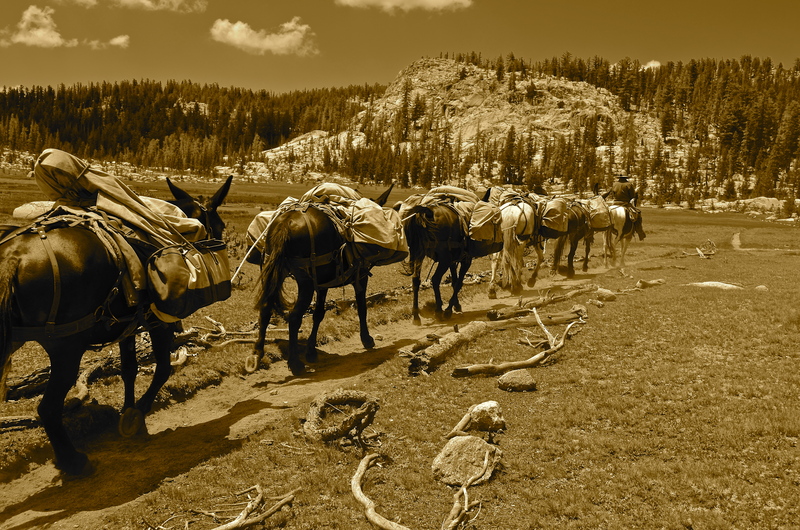 The first of many pack mule trains. Is this 1913 or 2013? As we made our way south, the view of the Cathedral Range opened up. We stopped for lunch near Sunrise Camp and filtered some water. 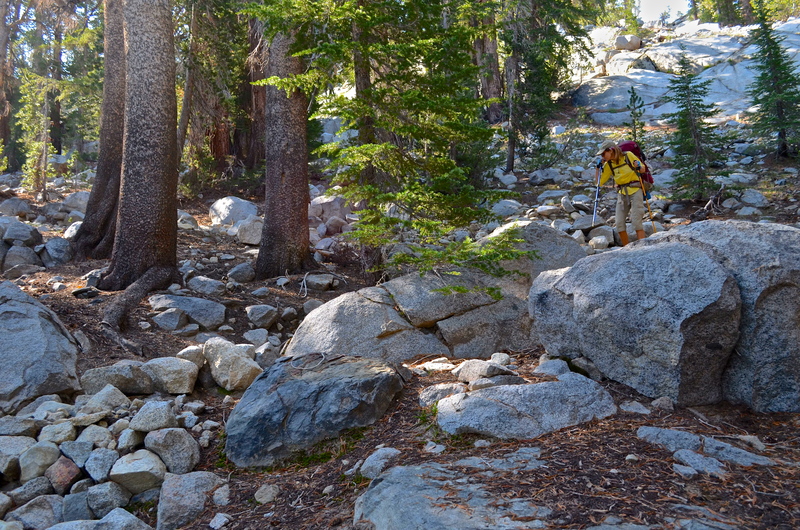 During this backcountry trip, we typically carried two liters since there was plenty of water. 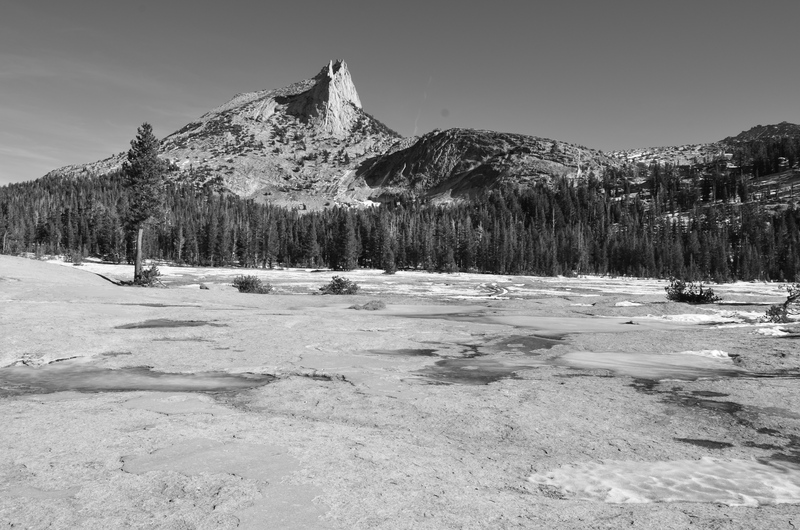 As we passed through the meadow near Sunrise, we began a gradual descent through a burned area and saw Half Dome for the first time. Entering a thickly wooded area, the downhill was steeper and the views diminished. Several southbound hikers asked about available water. It’s important to have maps that show the various creeks and streams. 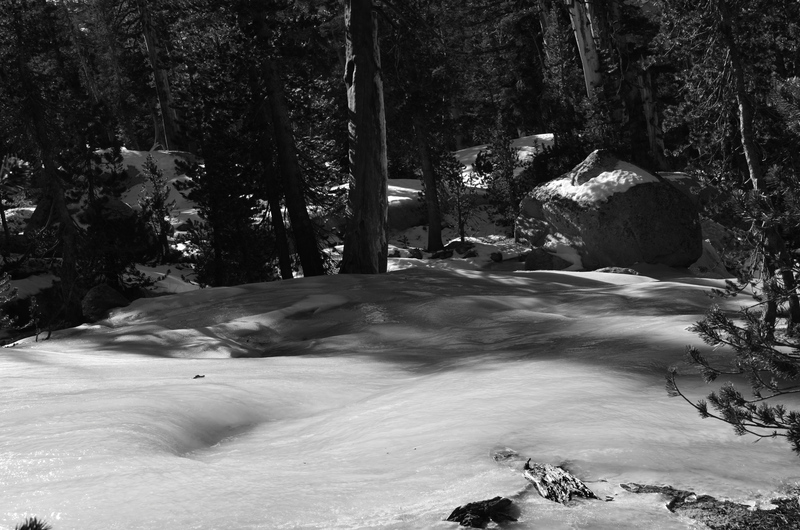 While water was generally abundant, there were many areas where the vernal streams were dry. 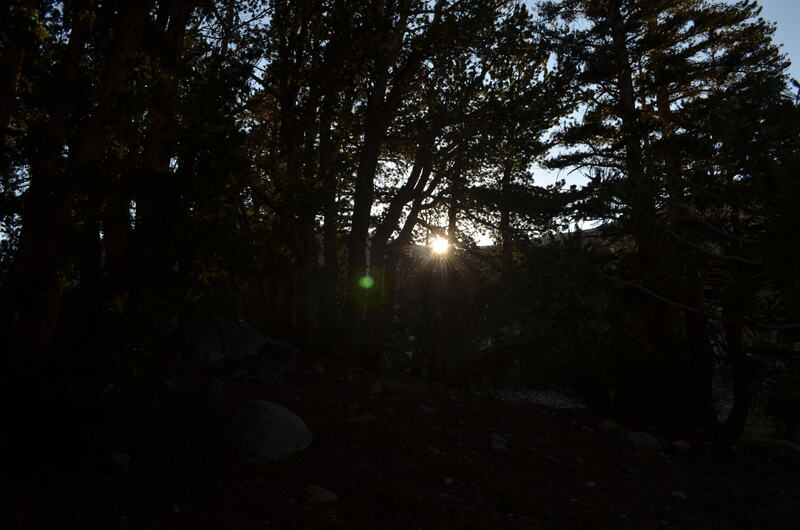 Using an excerpt from the JMT guide that showed potential campsites, I started scanning for a suitable location. I saw movement to my right and initially thought that it was another deer. It was big and moving slowly. Hey, a bear! It was about 75-100 ft. away and rooting around a log. Glancing over its’ shoulder at us, the bruin ignored us and continued to dig. It appeared to be an old brown bear around 300 lbs. We snapped a few photos and moved on. 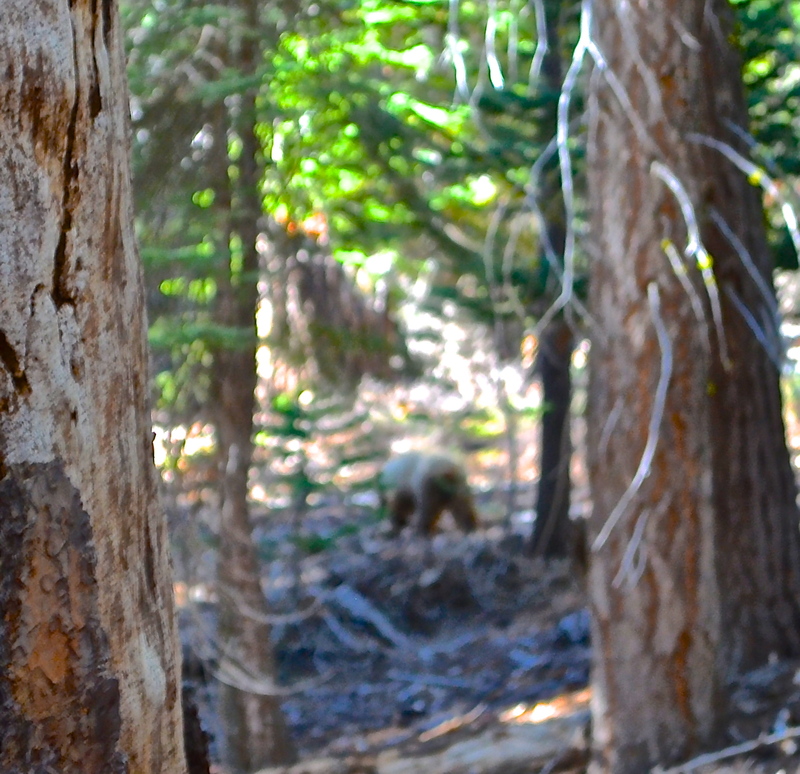 Blurry pic of a brown bear on the JMT/PCT. 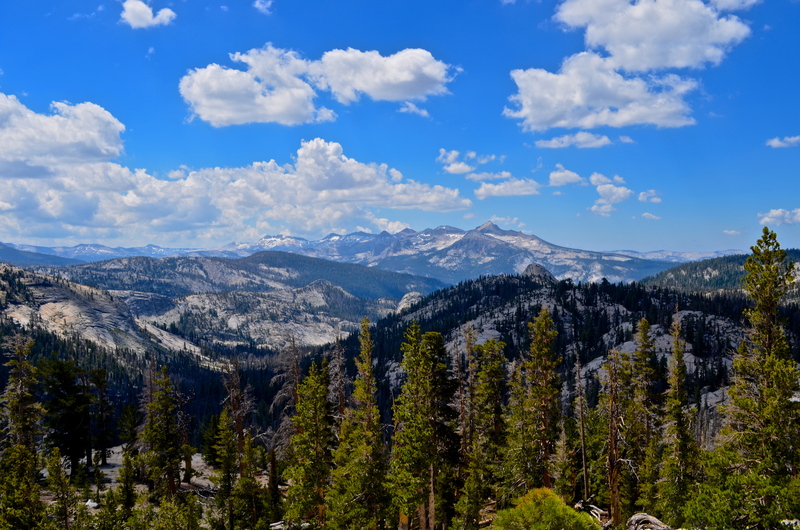 This was about 2 miles south of Half Dome. 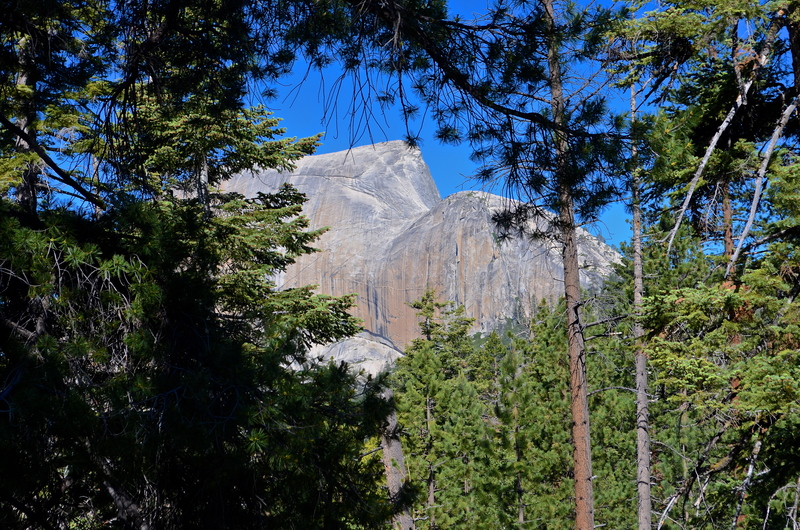 Within 10 minutes, we located a site to camp with a view of Half Dome. This was a busy area, mainly used by campers as a staging area for climbing the rock. Most of the other campers were out of sight, but you could hear them as well as see the smoke from various campfires. This had been a long day and we had one last dinner on the trail. We started a small fire and enjoyed the peacefulness. Sadly, tomorrow would be the end of our seven-day trek. I was getting used to this camping stuff, but looked forward to a real shower. Well, that and maybe a cheeseburger. 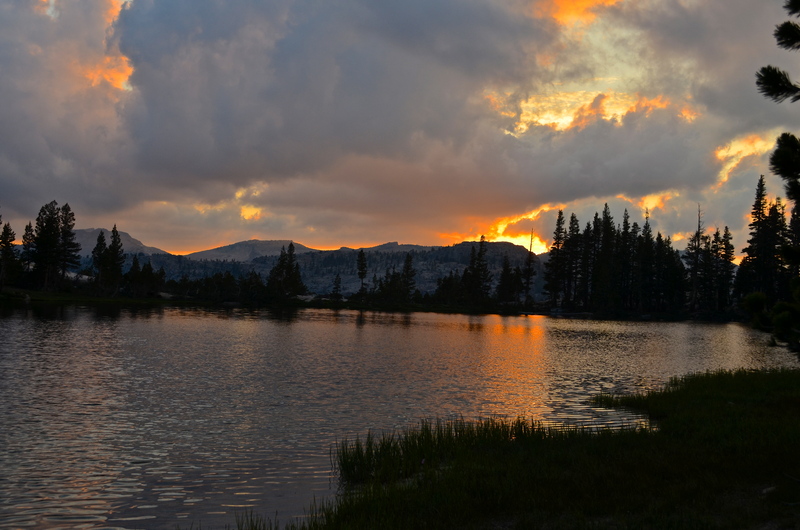 This day should have been called “The Race to Tuolumne”. 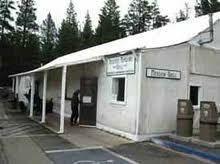 It was July 3rd and we were trying to make it to the Tuolumne post office to retrieve our resupply package before it closed at 4. 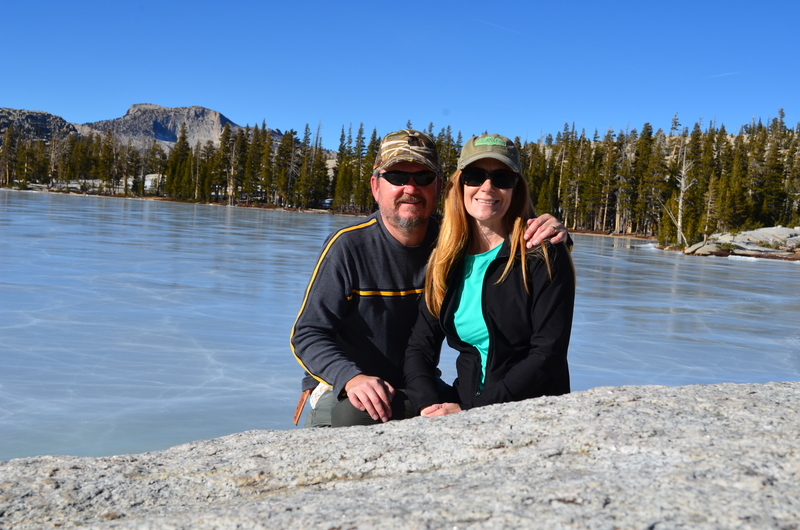 While a stop in Tuolumne Meadows would be nice, we didn’t want to spend the holiday on the 4th waiting around for a package. 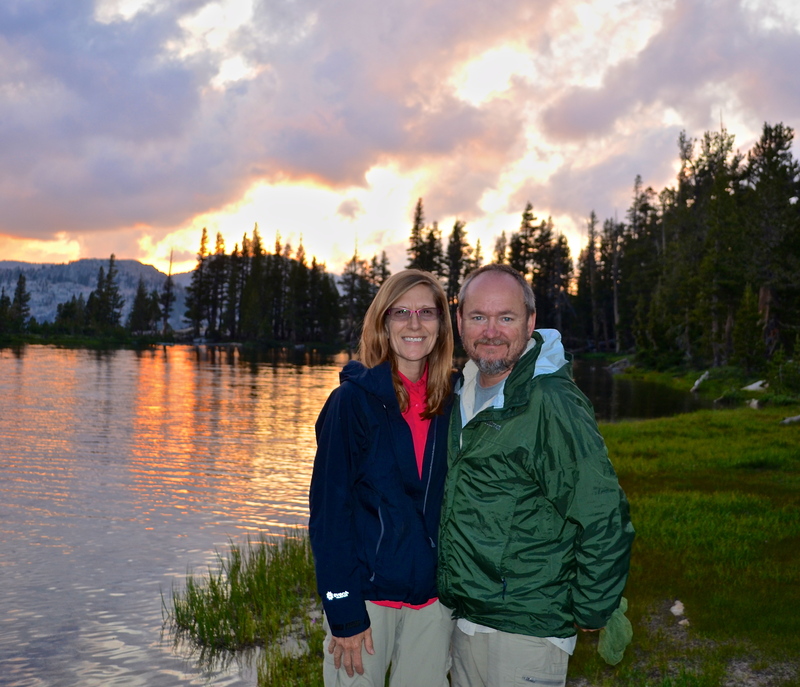 Tuolumne Meadows is a great place to hang out, but a zero day around the Cathedral Lakes would be ideal. 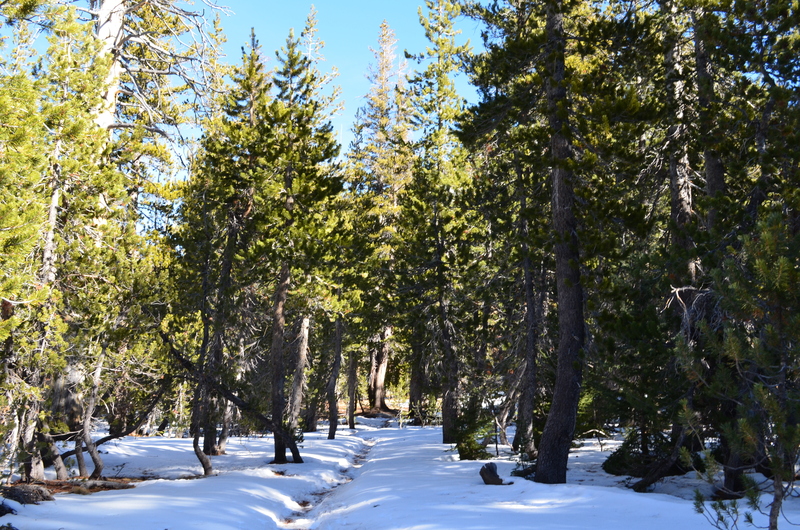 Getting our usual late start, we were on the trail and looking forward to the flat paths of Lyell Canyon. We had to drop around 500 ft. and enjoyed the relative shade of the pines as we followed the river. We noticed a large deer grazing in the distance. It was a pregnant doe who kept one eye on us, but wasn’t very concerned. 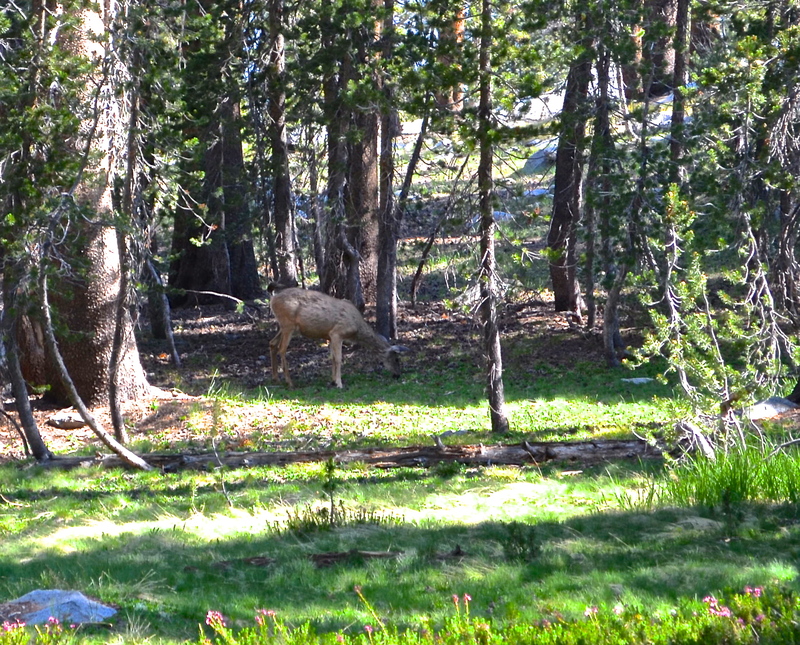 These creatures have few predators in Yosemite. 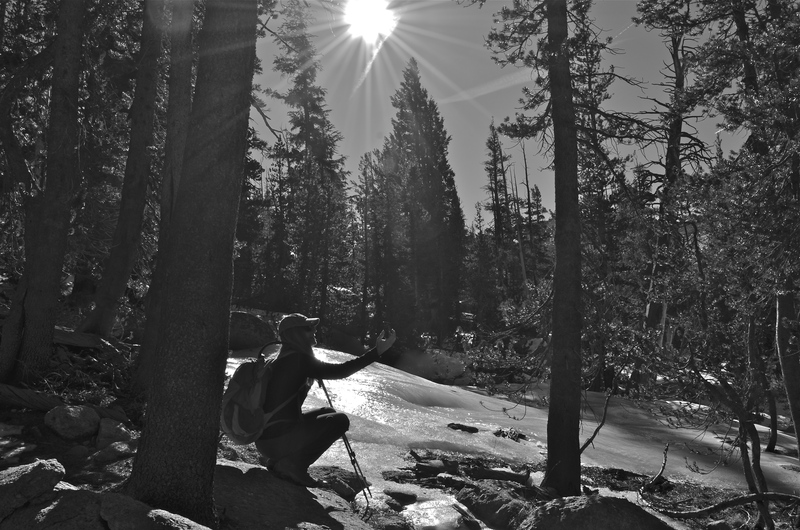 As the terrain flattened out, we picked up the pace and the sun was beaming down. It was hot as the path meandered in and out of the forest. To our left, Amelia Earhart Peak loomed over us. 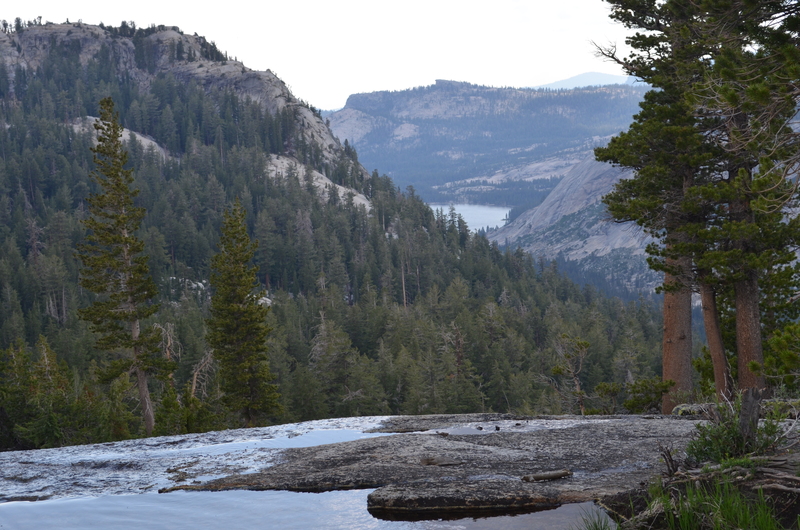 We would see this ridge from another angle as the trail would do a horseshoe after Tuolumne. Distant rumblings of early afternoon thunderstorms were behind and to the west of us. 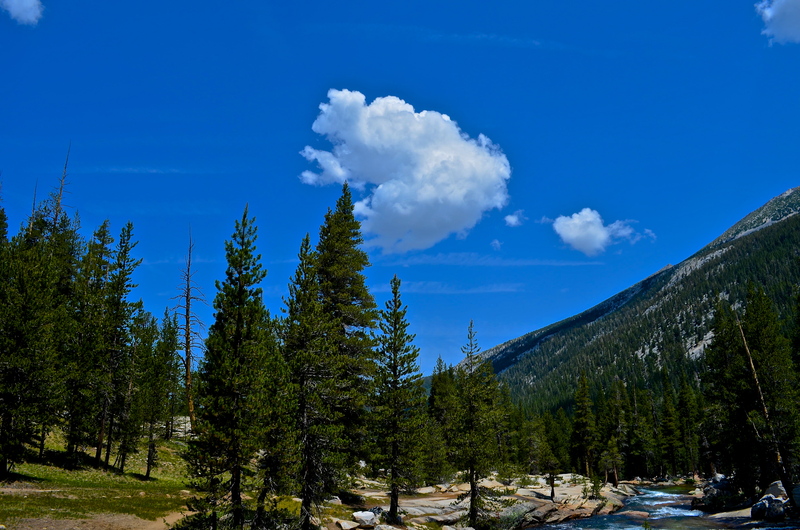 We passed an area where day hikers from Tuolumne had gathered around a nice area on the river. The number of people increased as we closed in on Tioga Road. 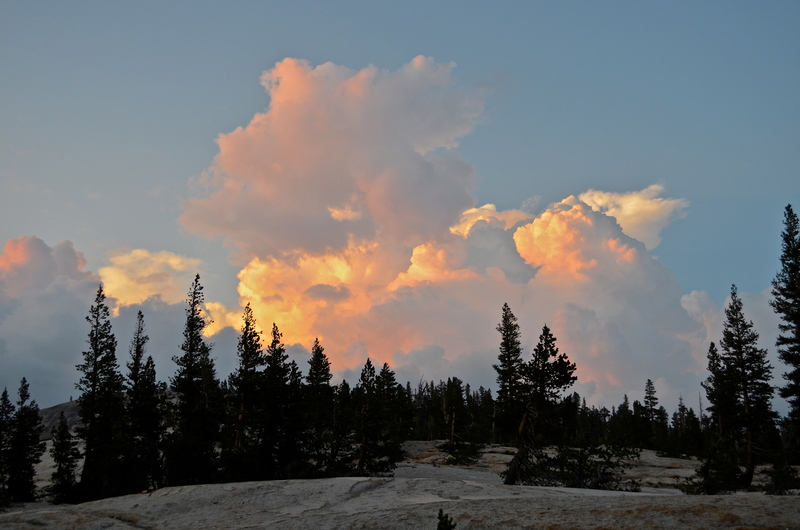 As we neared Tuolumne, the thunder was more frequent and louder. A fairly close crack of thunder prompted us to spread out a bit as we picked up the pace. Occasional large splatters of rain filtered down through the pines. 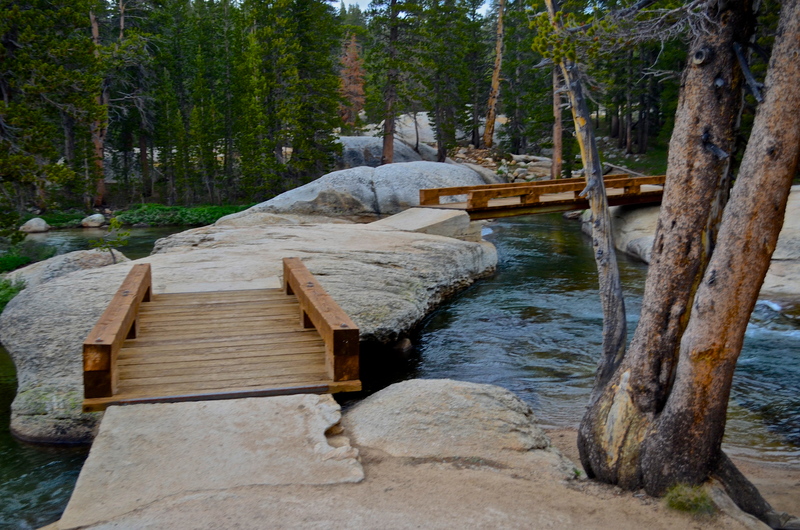 We crossed a couple of foot-bridges where the Lyell Fork neared the main branch of the Tuolumne River. We emerged in the parking lot near the lodge and started walking down the road. It was strange to be in civilization after days on the trail. A local worker from the Tuolumne Meadows store graciously gave us a ride to the post office. As we pulled into the parking area, the scene was chaotic. Tourists and hikers were like ants swarming around the store. It took a few minutes to absorb the busy surroundings. Near the road was a collection of picnic tables where thru-hikers lounged around. A family sat at one of the tables listening to a PCT hiker expound on his trail life. It was like storytime at the preschool. Other hikers were going through their resupply packages. We would get some refreshments and pick up our packages at the window. The post office here was a small room with a window on the outside of the store. The clerk was friendly and politely asked if we could open our packages over where the thru-hikers were. We obliged, and noticed the grill. The thought of cheeseburgers and fries was too much. We gave in to our cravings and enjoyed the greasy goodness. Mmmmm. We made our way to the backpackers camp. It’s first come first serve and $5 per camper. We found out how many hikers are moochers and “stealth camp”. You know the ones who are too cheap to pay the fee. Bathrooms are at a premium here – only one within walking distance of the camp and it was uber-busy. Bring a flashlight, no electricity in these rustic restrooms. At 8:00 p.m. a ranger hosts a campfire in the amphitheater near the backpacker’s camp. Ranger Sally provided an excellent presentation of Yosemite history and we learned a lot about owls. We really enjoyed hanging out and laughing at other campers who participated in the campfire. 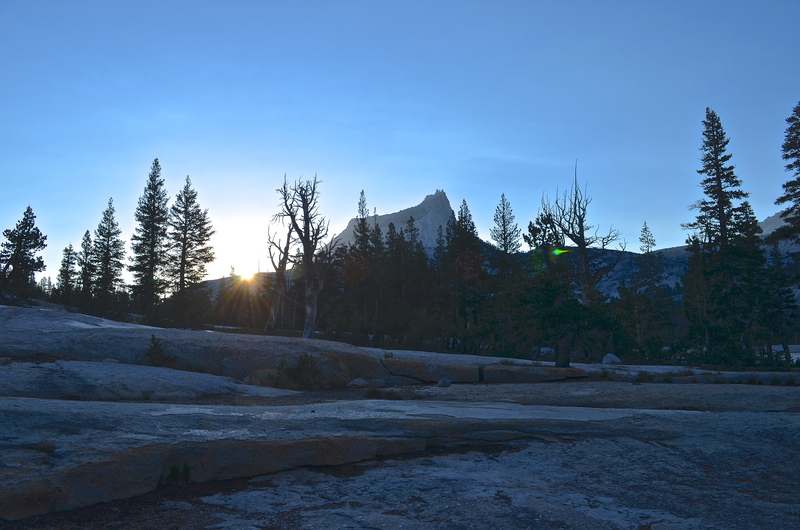 Even though Tuolumne Meadows was much lower in altitude than our previous campsites, it was the coolest night yet. Temps dipped into the 40’s as we snuggled deep in our sleeping bags. Tomorrow, we would head up to Cathedral and enjoy some downtime.